Hey anonto, were you referring to Mobile tower upgrades or home internet? If you had a fault reference number handy, we can pinpoint your service and give you an update on any planned upgrades for your area. Home internet, specifically the Fairfield3 CMTS. Thanks for the clarification. The latest information from our Network team is that your area is scheduled for an upgrade and Equipment has been delivered and being installed. At the moment it is planned to be completed during August 2015 however this estimate is tentative only and can be moved back if engineers are required to attend to faults or outages. Did the upgrades take place today? Because I'm currently experiencing a huge boost to my speed at the moment, normally at this time it's about 2-4mb download but now it's 30-65mb. And now we're back to 3-4mb, knew it was too good to be true. im going to call up and ask for a discount, becuase im not receiving a sevice that im paying for. We are now in 2016 and this still hasn't been addressed I've was told 3-4 weeks it should be done waiting on a mod to confirm this ? 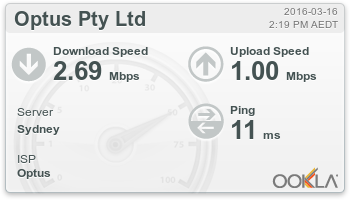 Been waiting for a year and speeds are still terrible during peak hours... optus. After about 5-6 months my speeds are back to what it was almost the entirety of last year, at the time of this post my download speed is 5mbps. I was on the Fairfield 3 CMTS then was moved to Fairfield 4 towards the end of last year. This is getting extremely annoying as last year all that was said was "oh it will be fixed by the end of the month..." over several months throughout last year. This is unacceptable, what's worse is I still see this crap advertised.